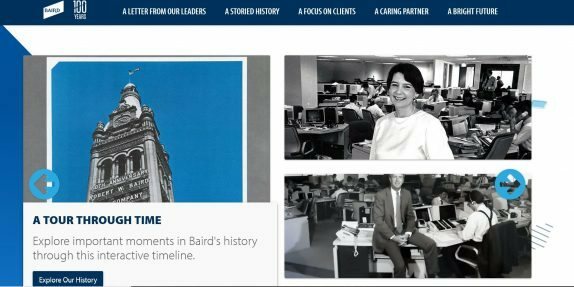 The intro to Baird's 100th anniversary timeline, part of a seamless centennial campaign. Everything to do with your business anniversary should be seamless, not scattered. The financial firm Baird gets it right with its 100th anniversary campaign. Alerted to Baird by a 7-second sponsorship clip on the Marketplace radio program, we searched on “Baird 100” and found a beautifully constructed website. What’s more, the site is up and running in advance of the company’s 2019 centennial, a logical marketing move that is nonetheless all too rare. Each of these, including an interactive timeline, makes it easy to grab the top-line branding message or to drill down for details. Our only cavil is that Baird’s main website doesn’t seem to have a crossover link, at least yet. The attractive Baird 100 logo appears there but can’t be clicked on.